More and more people want to try biathlon. It is the mixture of precision and endurance that makes this discipline that popular. Not only professional biathletes and cross country skiers find the perfect offer, also leisure and amateur sportsmen and women and people on holiday get the possibility to do biathlon and cross country skiing with professional supervision at the Hohenzollern Ski Stadium. Biathlon world cups inspire more and more people. The spectators stand directly at the course or watch the events live on TV. On choices of the best German sportsman or sportswoman biathletes traditionally occupy the places at the front. The Hohenzollern Ski Stadium is one of the top venues for these kinds of sport events. 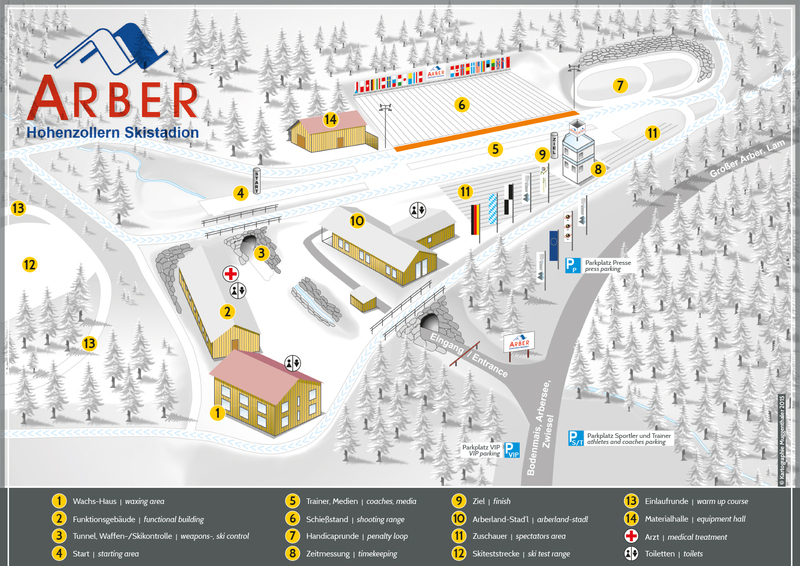 The Hohenzollern Ski Stadium is a regional intensive training center for ski sport with the tasks talent scouting, encouraging new talents, boosting of competitive sport as well as realization of central courses and competitions of SVBW, BSV and DSV. The Hohenzollern Ski Stadium is located in unique scenery directly at the Great Arber Lake on an altitude of 950 meters, near the Czech border. The stadium is named after the prince of Hohenzollern who is at the same time owner of the property.